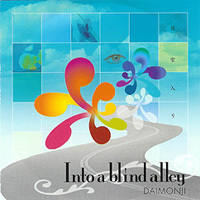 The second Daimonji album sees the dynamic trio unleashing yet more of their improvised prog onto an unsuspecting world. The debut album featured a lot of Fender Rhodes piano (or something which sounds very similar) and had something of a zeuhl feel; on this occasion there are more synths in evidence and the sound is what you might get if a RIO band was let loose on ELP's equipment. Symphonic prog sounds are the order of the day, although the musical style is firmly in avant prog territory. Starstruck kicks off with a squall of vintage moog sounds from Hoppy Kaniyama and Yoshida Tatsuya giving his kit a sound thrashing before the trio settle into a groove that bears a passing resemblance to an Acid Mothers Temple free form freak out. Mitsuro Natsuno underpins everything with an urgent, rumbling bass line that stalks the other two musicians like a hungry predator. Some zeuhl style vocals pop up occasionally, with Yoshida and Hoppy singing in a harmony of their own invention, but for the first part of the piece it's the synths that steal the show. It's clear that they had progressed considerably since their debut, with more assertive bass work from Natsuno and Yoshida easing up on his kit to sound more like a jazz drummer at times, while Hoppy shifts between synth, mellotron, organ and electric piano sounds at will. The vocals are better incorporated than before, and in general it sounds like the three musicians have benefited from some extensive gigging together. As the piece unfolds the sound shifts closer to their debut album, with piano taking over as the main keyboard sound and passages that sound more like free jazz than prog rock, although the groove usually reasserts itself within a few bars. The 20 minute epic draws to a close with some freeform piano and vocal, having covered a remarkable variety of musical bases. The remaining 3 pieces are all a little more concise at 12 - 13 minutes long, but the sound and style are consistent with the Starstruck. Some of the jazz influences that could be heard on their first outing occasionally pop up, but for the most part it's vintage prog sounds with an avant prog sensibility; if you liked their earlier work, you'll love this. It's difficult to choose between this album and Daimonji's first release. The greater variety of keyboard sounds and the sharper focus in the playing are definite pluses, but Yoshida's vocals are something of an acquired taste and may be off putting for newcomers. The playing is superb and the interplay between the three musicians is occasionally breathtaking, but this is free improvisation and the sound does get very abstract at times. Four stars, with half a star extra if you're a fan of Japanese avant prog.